Footage from SpaceX booster as it returns from space. The Falcon 9 roars into space from the launch facility at Cape Canaveral in Florida. On Friday (May 27, 2016) SpaceX launched a Falcon 9 rocket with the THAICOM 8 satellite into orbit. The launch went off right on time (after a one-day delay due to an unusual reading from the upper stage on the Thursday launch attempt), with the Falcon roaring into the sky, the 25th in the Falcon 9 line to do so. It was also the fifth time in a row SpaceX attempted to land the first stage booster back on Earth, and as hoped the booster successfully touched down on the floating drone ship Of Course I Still Love You about nine minutes after launch. The landing was, as usual, pretty spectacular, but a few hours later SpaceX released this, and I have to say it’s just about the coolest thing I’ve ever watched: Time-lapse footage from the booster itself, the camera pointed down, as the rocket comes all the way back from space and lands in the Atlantic! So what did you just see? The rocket has two stages. The first stage boosts the upper stage (which has the payload on top protected inside a fairing) to get it most of the way up above the Earth’s atmosphere. Then to save weight, the first stage is dropped, and the second stage takes over, boosting the payload into orbit. In the past, most rockets just drop the first stage into the ocean. But the plan from SpaceX is to recover the first stage, clean it up, and reuse it, thereby saving many millions of dollars over building another one from scratch. This isn’t easy. The first stage is moving very rapidly, many thousands of kilometers per hour in an arc to the east over the ocean. It uses cold jets (basically compressed gas) to flip over and point its bottom into the direction of motion, then uses a re-entry burn to slow its initial motion, and air drag to slow itself further. The waffle-looking steering fins are used together with more cold jets to maintain the correct attitude (orientation) as it descends back toward Earth. The huge pressures involved cloud the view for a moment, but then it clears and you can see lines of clouds over the water, then —quite suddenly, it seems—the drone ship appears, and the booster burns again in the last few seconds to slow for landing. This landing was particularly difficult; the satellite had to be boosted to a geosynchronous orbit, which is much higher than low Earth orbit, so the rocket had to travel must faster. That meant the landing was harder than usual, and the SpaceX team was cautioning everyone it might not work. It did, but perhaps not perfectly; the booster appears to be leaning to one side after touchdown. There is a compressible aluminum honeycomb structure inside (called a crush core) to absorb some of the energy of landing, and it took the brunt of the landing impact; that’s most likely why the rocket was leaning. The good news is the core can be replaced once the booster is back at the SpaceX facility in Florida. Moments after watching the booster land live on the SpaceX video feed, I wondered to myself if we’d ever get used to something like this; seeing a rocket from space come back to land much like the scifi movies I used to watch as a kid. I hope it never gets old. Oh look, a rocket on a boat. 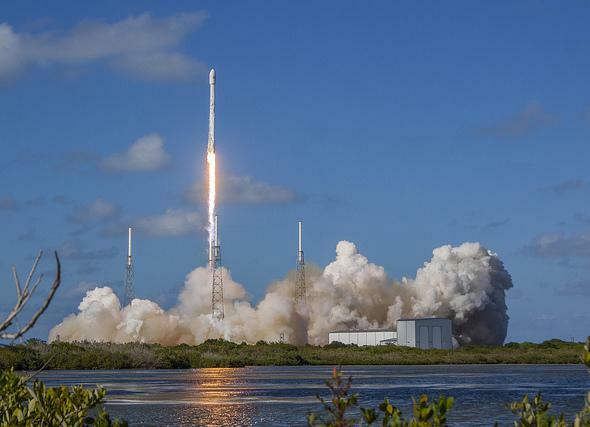 The next SpaceX launch is scheduled for June 16, and will be another communications satellite.